I understand the point Dr. Rah was making and why the audience enthusiastically applauded in response. No doubt, many white missionaries over the past two centuries have exhibited ethnocentric attitudes, believing their Western culture to be superior to the culture of the people they served. And, he’s right that white believers, and all believers for that matter, should seek to learn from Christians who see the world through a different cultural lens. However, with Elisabeth Elliot’s passing this week, I couldn’t help but think of how unfair Dr. Rah’s statement is too. Can we really reduce the work of missionaries like Elizabeth Elliot and her husband Jim Elliot to colonialism if they don’t pass a certain test? What about the Elliot’s colleagues – Nate Saint, Ed McCully, Peter Fleming and Roger Youderian? All were brutally murdered, along with Jim, by the Huaorani people of Ecuador – the very people they were attempting to help. Were all these missionaries colonialists? I honestly don’t know if any of them would have passed Dr. Rah’s test. To me, these missionaries are heroes. They gave everything they had to share the gospel with strangers. And, despite what happened to her husband, Elisabeth Elliot returned to Ecuador, along with Rachel Saint, Nate Saint’s sister, and ministered for years to the Huaorani people. As a result, many Huaorani came to Christ, which essentially eliminated the tribal violence that had dominated Huaorani society. I find these kinds of blanket statements extremely unhelpful because they dishonor the incredible good that white missionaries have done. Honestly, who are we, who have sacrificed very little in comparison, to stand in judgment of them? In fairness to Dr. Rah, I should mention that he didn’t call any specific missionaries colonialists. Still, I find these kinds of blanket statements extremely unhelpful because they dishonor the incredible good that white missionaries have done. Honestly, who are we, who have sacrificed very little in comparison, to stand in judgment of them? Yes, like colonialists, some white missionaries were extremely culturally insensitive. However, unlike colonialists, white missionaries were not driven by greed and self-interest. In fact very few gained anything material from their service and many sacrificed everything they had. I admit, I’m not objective when it comes to this topic. My grandparents, the late Dr. S.I. and Alice McMillen, were one of the first Wesleyan missionaries to serve in Sierra Leone, West Africa. My grandpa built Kamakwie Hospital and practiced medicine; my grandmother taught Bible. Today, we laugh at some of my grandparents’ misconceptions. For example, whenever they went outside, they wore pith helmets because they believed white people would die without helmets in the hot African sun. Yet, despite their ignorance and foreign ideas, my grandparents helped establish the Wesleyan ministry in Sierra Leone. My grandfather also discovered a cure to noma, a fatal children’s disease common at that time. My grandparents, Dr. S.I. and Alice McMillen, holding my mother, Linda Stern. Today, Kamakwie Hospital remains one of the finest hospitals in West Africa, but it’s no longer run by Westerners. As is the norm with Christian institutions founded by Western missionaries, Kamakwie is now run by Dr. N’falie Ibrahim Sesay, a Sierra Leonean national. The Wesleyan Church in Sierra Leone is also run by a national — Rev. Usman Fornah, a man of incredible faith whose courage during the country’s civil war is legendary. In some ways, the tables are now turned: Rev. Fornah recently visited the U.S. and shared his story with American congregations. No doubt, as persecution mounts here, we’ll increasingly be looking to our African brothers and sisters to show us the way. My parents also spent about a decade in what’s now the country of Zimbabwe. My father (pictured above) served as a surgeon at Mtshabezi Hospital and trained my mother, an English major with a Greek minor, to be his scrub nurse. 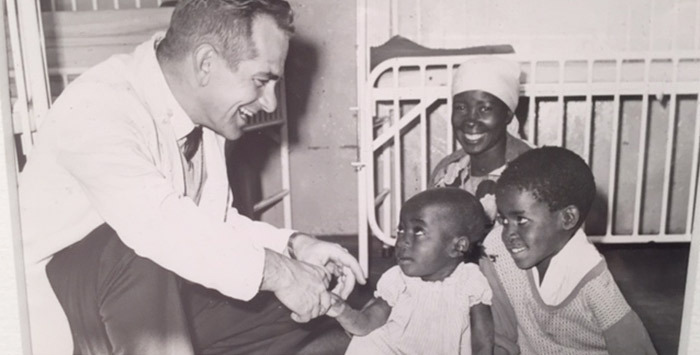 He also trained several Africans with only a high school education to do minor surgeries, like appendectomies. It’s true that my parents lived in a Western-style house with running water and a concrete floor. They also had two African servants, something they initially resisted, but relented after the women persistently begged to work in return for food. But, they did a decade of great medical work. They also greatly admired the people they served. They would often wistfully recall the incredible worship at African churches and lament the staid worship in many American churches. After living in Africa, it was tough for us kids to get much sympathy for our small troubles. I can remember once complaining about chores and my father recounting that some African women he knew would go into the bush, have a baby and return to work. That was kind of hard to top. That’s quite an assertion. And, there may be evidence to support it, though the article didn’t offer any. South African Archbishop Desmond Tutu once said, “When the missionaries came to Africa they had the Bible and we had the land. They said ‘Let us pray.’ We closed our eyes. When we opened them we had the Bible and they had the land.” Certainly, these things happened, especially in South Africa. But, we need to be balanced in our appraisal of missionaries. The truth is, despite their many shortcomings, white, Protestant missionaries – unlike colonialists – have done incredible good in this world. The truth is, despite their many shortcomings, white, Protestant missionaries – unlike colonialists – have done incredible good in this world. Obviously, they’ve spread Christianity worldwide and changed the eternities of scores of people. But, as an article in Christianity Today reports, missionaries have done much more than that. Extensive research by sociologist Robert Woodberry showed that areas where Protestant missionaries have had a “significant presence” are more economically developed. They also have better health, lower corruption, and higher educational attainment. In fact, the past presence of Protestant missionaries is the single, most important factor contributing to a country being democratic today. According to Woodberry, “conversionary Protestants” – those not funded by the state – were also very critical of colonialism. One striking example is John and Alice Harris, two British Baptist missionaries in the early 1900s. This couple smuggled pictures of the atrocities committed by colonialists in the Belgian Congo out of the country. They then travelled throughout Britain and the U.S., using the pictures to spark international protest against the human rights violations. Similarly, in India, missionaries fought exploitation by landlords. In China, they helped end the opium trade. And in the West Indies, they bolstered the abolition movement. Even so, the world will continue to portray missionaries in a very unsympathetic light. Anthropologist Laura Rival blames missionaries like the Elliots and Saints for destroying the culture of the Huaorani people. By eliminating Huaorani cultural norms like polygamy and violence, she says, missionaries paved the way for the Huaorani to intermarry and assimilate into mainstream Ecuadorian culture. This, Rival claims, is a very bad thing. I suppose to some, any and all Christianizing of a society is tantamount to colonization. But, as believers, we know better. Yes, white missionaries have made plenty of mistakes. And yes, some have had very impure motives. But, the majority were trying to serve God and serve people. So, let’s offer specific and fair criticism when warranted. But, let’s stop calling white missionaries colonialists. To do so is simply unjust and wrong.